Forty years after Prime Minister Pierre Trudeau created Via Rail with a simple cabinet order, Justin Trudeau's cabinet now faces a multibillion-dollar decision on whether the federal government should fund a major expansion of intercity passenger rail. Via itself has said the rail company is at a crossroads. Much of its aging fleet of rail cars and locomotives are in need of replacement, with some of the cars dating back to 1947. Via is a Crown corporation that survives in a precarious legal status. There is no federal legislation outlining its mandate. Its funding fluctuates wildly from year to year based on haphazard top-ups in federal budgets. In December, Via president Yves Desjardins-Siciliano submitted an ambitious proposal to the federal government, called High Frequency Rail, that is focused on the Quebec City-to-Toronto corridor. The plan would replace the rolling stock with new locomotives and cars, increase service and build new dedicated passenger rail lines to reduce delays caused by sharing track with freight traffic. Via estimates the project would cost $4-billion, plus an additional $2-billion if the service was fully electrified. It is also asking for $1.5-billion to renew the fleet on its existing lines in the corridor. 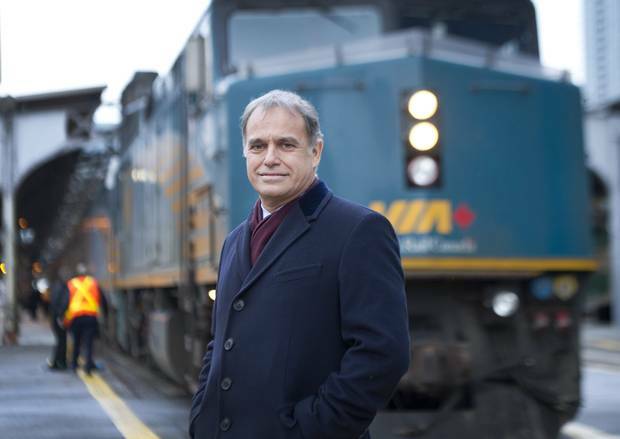 CEO of VIA Rail Yves Desjardins-Siciliano is photographed at Union Station in Toronto, Ontario, Tuesday, December 9, 2014. The billions in spending would not produce high-speed bullet trains that are common in Europe and Asia and that will soon be in place in parts of Africa. Rather, high-frequency rail describes newly-built, traditional trains that run much more frequently and reliably at a top speed of about 177 km/hr. That has disappointed advocates who want to see full high-speed rail, an option that was recently recommended for the Toronto-to-Windsor corridor in a report for the Ontario government. That proposal in May from former federal transport minister David Collenette called for trains that would reach speeds of up to 250 km/hr. Even higher speeds are possible. A Japan Railway train reached 603 km/hr on a test track in 2016, setting a world record. New details of the plan include a map of the proposed route in which a dedicated rail line would run from Quebec City, north of the St. Lawrence River through Trois-Rivières to Montreal, then on to Ottawa, and through Eastern Ontario to Smiths Falls, Sharbot Lake, Tweed, Peterborough and Toronto. Proponents of Via's plan counter that it is a more realistic, cost-effective response to growing demand for a downtown-to-downtown travel option that doesn't involve driving on increasingly congested highways. Via has indicated that it expects a federal decision this year. Federal Transport Minister Marc Garneau and Finance Minister Bill Morneau, who are the two main decision makers on the file, have not indicated how they are leaning, nor have they committed to a deadline for making a decision. The 2016 federal budget devoted $3.3-million over three years for Transport Canada to study Via's plan. Other Liberal MPs and ministers representing ridings along the route – including Trade Minister François-Philippe Champagne, have spoken out in favour. In recent months, cities and towns in Ontario and Quebec that stand to benefit from Via's expansion plans have passed resolutions or held news conferences in support of Via's pitch in an effort to pressure the federal Liberals into supporting the plan. Peterborough Mayor Daryl Bennett, who remembers when Via ended its Peterborough train service in 1990, praises Via's plan as a "common-sense" approach that will find more support now in light of the worsened traffic throughout the Greater Toronto Area. "You never know whether [driving to Toronto] is going to be an hour and a half, as it should be, or whether it's going to be three hours," he said. "We had not perhaps embraced [the train] as much as we should back in those days." "There was a mindset that the car gave you that freedom to do as you wish once you got out on the road and made your way into Toronto. That has diminished considerably since that period of time with the volumes of motorists doing exactly that. So I think people are looking forward to the alternative [of a] train again," Mr. Bennett said. Via's Mr. Desjardins-Siciliano has been quietly meeting with municipal leaders along the proposed routes, encouraging them to speak out in favour of the plan. The project could be a potential contender for funding through the new Canada Infrastructure Bank, which will launch later this year with a mandate to pool public money and private dollars from institutional investors such as pension funds. Hendrik Brakel, senior director of economic, financial and tax policy with the Canadian Chamber of Commerce, said Via's proposal should fit within the bank's mandate for funding. "This is exactly the kind of infrastructure that would really benefit the Canadian economy," he said. "It would take cars off the road. It really would make a big difference to the speed and movement of professionals." One rail policy consultant who has performed contract work for Via and who has studied the abandoned line closely says there is a reason why CP removed the tracks. "It twists and turns and it's a roller coaster," said Greg Gormick. "The route itself is problematic. The concept of being free of the freight interference is great, but in execution, this thing is a disaster in the making… All I see are a lot of costs adding up, and when I ask the questions, the answer I get is 'we don't know.' If it's such a great plan, can we see it?" The consultant also says travellers going between Toronto and Montreal likely won't appreciate the less-direct routes through Ottawa. "Ottawa's a lovely town to visit, but not for five minutes at the station. It's not exactly a thrilling side trip," he said. Another new detail that has emerged is the role Kingston would play as a "hub" for communities along the existing CN line currently used by Via that runs along the shore of Lake Ontario and the Saint Lawrence River. According to Kingston Mayor Brian Paterson, he's been informed by Via that his city would become a "hub," and that many trains would start and end their routes in Kingston. That would make it easier for passengers to make day trips to Montreal, Toronto or Ottawa. These trains would also serve the existing stops along the CN route. These Via routes would still have to share track with freight, but Mr. Paterson said that should be much easier to manage when more of Via's trains are operating on the proposed new line. "There's a vision here for a pretty significant improvement," he said. Yet the drip, drip of new project details is also raising many new questions that Via will not answer. For instance, it is not clear how trains would get from Peterborough to Toronto's Union Station. Via says there are several options under consideration. A spokesperson said the company is working to secure federal approval for the general concept before more detailed plans can be released to the public. There is also the possibility that some of VIA's proposed new routes to Montreal won't reach the city's Central Station. That's because another major rail project – the $6-billion Réseau électrique métropolitain (REM), led by Quebec's pension fund – plans on using an existing tunnel to the station. There are questions as to whether Via's trains are compatible with the light-rail lines the REM would install in the tunnel. Via says a technical team is working on this issue, but the company has previously said that some passengers may have to use the light rail line through the tunnel to connect to a Via rail line for some trips. Another potential red flag is Via Rail's recent history when it comes to delivering on its promises. A 2016 report by Auditor-General Michael Ferguson highlighted a handful of examples where Via projects came in well over budget and failed to deliver on promised improvements to service. Via proposed a deal with CN to improve parts of the main track between Montreal and Toronto in 2007 with an initial cost estimate of $21-million. By 2009, the plan had grown to a $251-million effort to triple track 160 kms at a cost of $1.6-million per km. By 2014, the Auditor-General said that Via had spent $318.5-million and only managed to triple track 70 kms, at a cost of $4.5-million per km. Rather than improving travel time, the Auditor-General said VIA's travel time and on-time performance had worsened. In some ways, Via's challenges in working with CN illustrates why Via wants its own, entirely separate, rail line. A major review of the Canada Transportation Act led by Conservative-appointee David Emerson reported in 2016 that Via's plan has merit, provided the details are closely reviewed. "There is inherent incompatibility between freight and passenger trains," Mr. Emerson's report stated. "A dedicated track would be good for Canada: it would allow for additional passenger rail frequencies and more freight rail capacity in the long term and would help to lower highway congestion in Ontario and Quebec. However, any proposal from Via Rail would have to be carefully assessed to ensure that the elements relating to ridership and attracting private investment are viable."